In “Recycling Made Easy” I touched upon some common statistics regarding recycling, as well as a few general activities for teaching recycling to children, such as reading books like The Berenstain Bears Go Green, decorating recycling bins, collecting litter in the park, and exploring your home for items that can be reused or donated. But what can you specifically do in your classroom to encourage recycling? On average, students spend nearly seven hours a day at school. That’s 180 hours each year, not including time spent in afterschool clubs or participating in school athletic programs. As a teacher, you want your classroom to be a safe, positive learning space, but with the right approach, you can also make your classroom a “green environment”. Rule #1: Make recycling easy. Think about the last time you drank bottled water. What did you do with the bottle? Did you save it or throw it in the trash? And if you trashed it, why? The reason you, and many, many people, choose not to recycle an item is simply that it was inconvenient at the time. You either didn’t have access to a recycling bin at that moment or it was so far away that you didn’t deem it worth the effort. 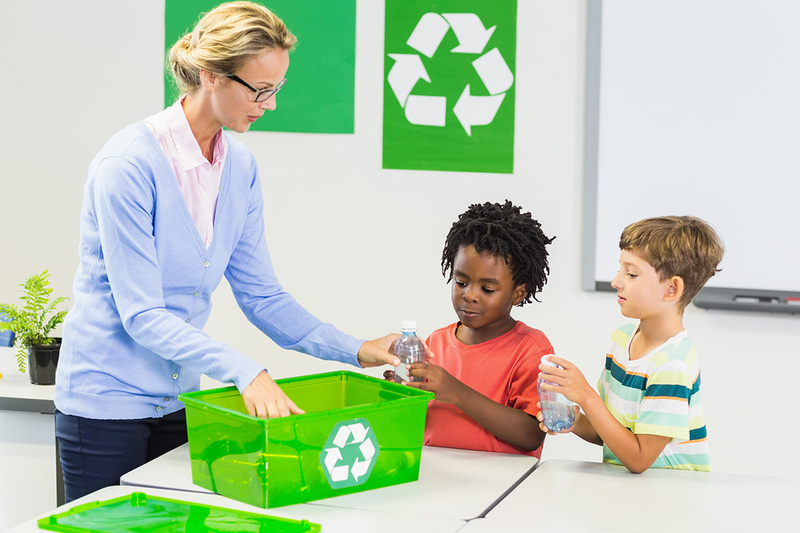 The best way to get your students to recycle is to make it simple, convenient, and easy. Place your classroom recycling bins next to trash bins in a place that can be easily seen from anywhere in the room! Never assume a child is too young to understand the concept of recycling. Children mimic. If they see you do something, like save paper scraps, they’ll do it too! Take the time to explain the importance of recycling and talk to your students about paper, plastic, metal, where they come from, how recycling prevents these items from going into landfills, and why reusing these items can reduce the need to cut down trees or dig up the earth to extract additional resources. Soda or juice cans, empty water bottles, or take-out containers from lunch. Plastic Ziploc or sandwich bags, which can be turned in at most grocery stores. Sheets of paper, especially if they’ve only used one side. For younger students, the best thing to focus on is recycling paper. As a teacher, you understand better than anyone how much paper your students go through, as you’re the one who prints and passes out worksheets. Encourage students to save their worksheets in a folder, and at the end of the school year, provide them with an opportunity to recycle it, rather than take all that paper home for their parents to discard. Recycling is so important and a number of companies recognize this and have compiled resources to make it easy for you to teach recycling to your students. Learn how to reduce, reuse, and recycle with The United States Environmental Protect Agency (EPA). Visit website. Learn classroom recycling practices for specific grade levels with GrowNYC. Visit website. Learn about the “Lorax Project Student Earth Day” with Seussville and have your students make a pledge in honor of Earth Day. Visit website. My ecology and conservation school assembly program is the way to kick off your recycling program or to get your students excited about Earth Day, which we celebrate every April. “Pollution Solution” uses emotion, not statistics, to engage students and tackle the subject of recycling. With magic, age-appropriate humor, join-in fun, and so much more, I will teach your students about why conservation matters, what they can do TODAY to protect the earth, how to identify trash vs recyclables, the 3 R’s, and more. Click here to learn more or contact me today at (716) 940-8963 to schedule your next assembly!